My kids are back in school, and Amazon just closed their deal to buy Whole Foods Market. What do these events have to do with one another, you ask? A lot. As with all things Amazon, their focus is on me—the customer—and my experience. The more they know about me, the more relevant my experience with them becomes. To that end, enter Whole Foods Market. The tech giant’s $13.7 billion purchase of Whole Foods has sent shock waves through the grocery industry and suspicions among Whole Foods loyalists who have concern about how their shopping experience—or the quality of the products they love—might change. But so far, the takeover has been all upside for consumers. According to Bloomberg.com, Amazon spent its first day as the owner of a brick-and-mortar grocery chain cutting prices as much as 43 percent. In the coming weeks, the Whole Foods rewards program will be rolled into Amazon Prime for added savings and in-store benefits. This affords Prime a valuable new perk to attract subscribers and will encourage Whole Foods shoppers to buy more—according to a survey by Morgan Stanley, 62% already have a Prime account. And 1010data found that Prime members have deeper pockets at Whole Foods than non-members, spending an average of $306 more over a 12-month period. Of course, as I eluded to, the strategic implications of Amazon’s purchase of Whole Foods go much deeper—the acquisition offers its buyer a lot more value than the margins on organic avocados and rotisserie chicken. I’m talking about data. Amazon already knows that I’m likely a mom of young children based on the diapers I order, the shows and movies we stream, and the parenting books I buy through my Prime membership. They also know I’m busy and seek ways to make my life more efficient, e.g. the Instant Pot pressure cooker I purchased. And now, if I shop at Whole Foods and use my Prime membership to get in-store perks and discounts, they will also be able to track my offline grocery store behavior and tie it all together. With massive amounts of data from Whole Foods shoppers, Amazon will ultimately be able to tailor the grocery shopping experience—and much more—to the individual. Let’s pretend for a moment I didn’t own that Instant Pot just yet. Maybe I had just stalked it a few times online (since everyone is talking about them). 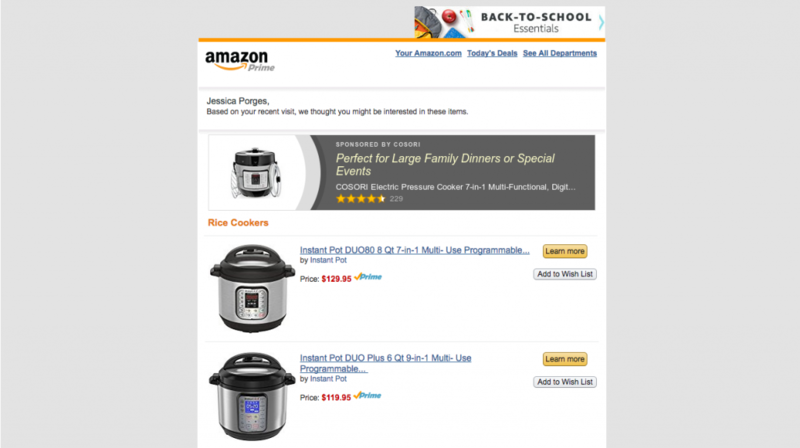 Amazon might send me one of their high-converting emails promoting the Instant Pot, maybe with same day delivery (in some areas). They might kick in some trending one-pot recipes for beginners, with a list of ingredients I could also order and have delivered to my doorstep by upgrading to AmazonFresh. The Amazon email I received after checking out the Instant Pot. You can easily see how it would make sense to include recipes. Amazon’s goal is to make it so easy for me to get my groceries from them that I continue to do so (as opposed to shopping at the other grocer to which I’ve been loyal my entire life). They can send me weekly emails with Instant Pot recipes and links to order the ingredients. Maybe they’ll even upsell me on some Instant Pot accessories, like silicone fingertip mitts and that popular glass lid. But they’ll also be able to learn what perishables I buy each week (because we never seem to have enough yogurt drinks or string cheese for my kids), automate it for me so I don’t have to even think about writing out a long grocery list, and deliver the food to my door (or have it ready and waiting for me in a locker at Whole Foods). Amazon is a master of the upsell, using a highly sophisticated algorithm to recommend the right products to the right customers, at just the right times. Their treasure trove of data enables them to analyze behavior from customers and use this information to recommend products to those shoppers as well as other shoppers with similar profiles. The company has integrated recommendations into nearly every part of the purchasing process from product discovery to checkout. They also dole out recommendations through email. Did you know that Amazon’s email marketing program analyzes the success of various campaigns and drives only the highest performing emails to a customer’s inbox? Smart. And now, whether shopping on Amazon.com or in Whole Foods retail locations, shoppers’ unique Prime identifiers are keeping track of all their activity, adding them to specific customer segments that can trigger personalized emails, messages on the website, retargeting ads and a multitude perks and offers. What can marketers learn from this tech behemoth with the potential to know everything there is to know about my movie preferences, lifestyle choices, kids’ snacking habits and my grocery aisle behavior? Regardless of the industry you’re in, your customers are engaged in a journey, and it’s your job to optimize the key decision points along their route with Amazon’s ninja-like precision. Here’s how to do it. Referring friends/family to Amazon Prime, AmazonFresh, etc. Think about the metrics. Use analytics tools to determine a baseline for your online and offline metrics at the conversion points currently implemented. Implement technology. You have data and you have a lot you want to do with it. Now you need the right technology to make it happen. Most of us don’t work for a company with the resources of Amazon, with several dozen people to build and optimize internal systems to power their customer experience. But, you can do the same with the right tool at the heart of your customer experiences. 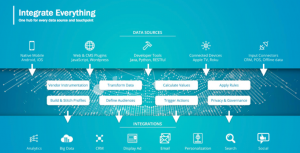 Tealium allows you to ingest multiple data sources, stitch them together, and then push meaningful data into other systems to trigger actions or to analyze for insights. If I’m looking at the Instant Pot but haven’t yet pulled the trigger, I’m placed in a group that will be encouraged to make the purchase via remarketing and retargeting tactics. If I decide to walk into Whole Foods and pick out my groceries the old-fashioned way, I’m incentivized by perks to reveal my Amazon Prime membership and, when I do, my website activity and in-store purchases become tied to the same member number and united in Tealium. From there, I can be put into another segment of customers, which may trigger certain personalization on the website that prompts me to share my experiences, sign up for perks and more. It’s likely I fall under a few different marketing categories: “high disposable income”, “young children”, “healthy lifestyle”, “tech gadget lover”. Because Amazon doesn’t want to flood my inbox, they will choose the most successful of the emails that are relevant to me that week, e.g. “top toys for children” or “best newly released workout videos” to increase the odds of me opening it, clicking through and potentially converting. No matter your industry, multi-channel analytics, personalization and re-marketing are your best digital marketing tools for driving conversions. Using a tool like Tealium enables you to tie customer data together and activate next steps. Let’s look at a few examples. If available, I tend to stay at Ritz-Carlton hotels when I travel. When I book my room online, I log into my existing account and enter my member number to earn rewards. 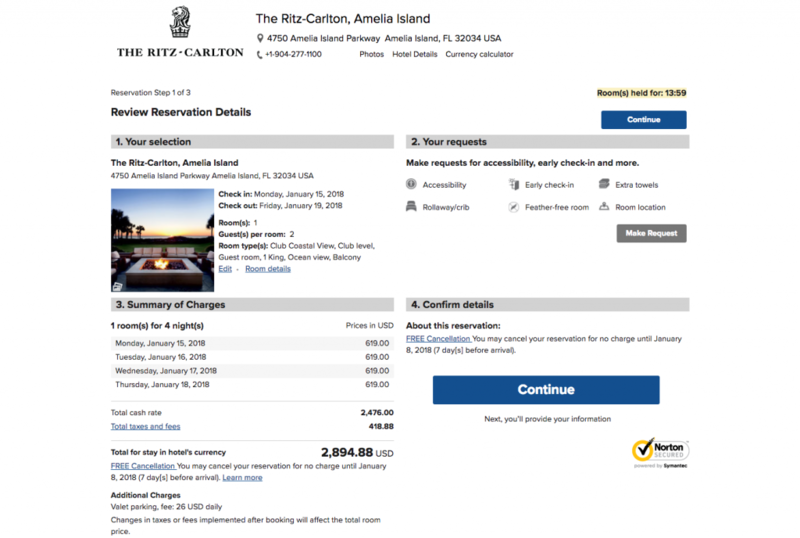 That gives Ritz-Carlton at least two unique identifiers to analyze my behavior and market to me in a more personalized way. Using a tool like Tealium, they can tie me to the types of rooms I’ve booked or upgraded to in the past from their CRM and tailor an “upgrade now and save” message to me. Tealium then tells their email service provider (ESP), such as Salesforce Marketing Cloud (SFMC), to send me that message as part of my confirmation email, or it tells a personalization tool like Optimizely to give me this message on the confirmation page. Or, both—it can serve up the upgrade message on the confirmation page and, if I don’t react, include it in the confirmation email. Perhaps the message comes to me before I even book the room. If Tealium sees that I didn’t choose the upgrade in the booking funnel, it could tell a tool like Yieldify to inject a targeted message in the booking process. It could also learn from the CRM that I’ve dined at their hotel restaurants and tell SFMC to send me a pre-arrival email with available dinner times during my stay. By targeting messages at key points in the conversion process, such as after a room type is selected, you can improve the customer experience and better meet your business goals. Opendoor.com is a relatively new company that buys and sells homes in a streamlined fashion– they supply a seller with a firm offer within 24 hours that the seller either accepts or rejects. After Opendoor owns the home, they make any necessary updates or renovations and then list the home in their inventory online. Anyone interested in viewing the property can gain access instructions through their mobile app. Let’s say I’m in the market for a new home, so I download the Opendoor app and set my search criteria. I go visit a few of the homes on my list, but none of them are the perfect combination of the features I want. As I leave each home, the app detects I’m leaving the area and sends a push notification to complete a short survey providing feedback on the home, perhaps using a tool like ForeSee. ForeSee then sends that information to Tealium. Did I love it, was it missing something? Tealium sends this data to Opendoor’s recommendations engine, to help make better recommendations to me (and others like me) to view other properties. At the same time, the data could even be combined with other data and sent to Domo, to help Opendoor analyze and select the appropriate features to look for in (or add to) the subsequent homes they invest in, getting close to a “just-in-time” model within the pre-existing real estate market. As a mom of two kids, I’m a frequenter of Urgent Care. Perhaps at my most recent visit, I opted in to receive newsletter communications from the health system. These emails may contain general tips on staying healthy, but Tealium can help connect the ESP to the CRM so that the email could also be personalized based on what the medical center knows about my previous visits (being careful to mention that I’m simply an anonymous patient ID, not a name, by simply grouping me into a segment). If I click through one of these emails to the site, perhaps to read about yoga exercises I can do at home, Tealium can connect my urgent care visit to my website visit and to the content I viewed, all in the CRM. Perhaps after reading about yoga, I read about primary care physicians before leaving the site. Tealium can now tell the ESP to personalize a section of my next email with information about choosing a PCP, maybe even including a short list of physicians near my home. It’s been estimated that more than 80 million people are Amazon Prime members. With this data, it is capable of building analytic models which can predict what these consumers will want, how much they will want, and when they will want it. Now that Amazon can collect and connect data from offline purchases as well, the power of their customer insights is unrivaled. Ok, so we can’t all be Amazon. But every digital marketer can optimize their business’s key performance indicators by understanding the customer journey and getting ahead of questions or roadblocks at each micro-conversion point. From there, you can use a toolbox of technologies and strategies to optimize the journey from consideration to purchase, and then help them to keep coming back for more. Remember, it’s personal. Customers care more about themselves than they care about you. Use data to make your communications as customer-centric as possible. That’s what Amazon does best and a key reason for purchasing Whole Foods. Follow their lead and make the best possible use of the data at your fingertips. The strategic implications of Amazon’s purchase of Whole Foods is less about brick-and-mortar retail or the margins on groceries. It’s about the data. No matter what industry you’re in, every digital marketer can and should optimize their business’s key performance indicators by understanding the customer journey and getting ahead of questions or roadblocks at each micro-conversion point. Tools like Tealium can help digital marketers gather data from various online and offline sources, slice and dice consumers into segmented groups, and share that data with other systems both for action and analysis. Remember, it’s personal. Use data to make your digital experiences as customer-centric as possible.